I recently reviewed a book manuscript for a colleague about Presbyterians and American culture that I hope will soon be published. It is an important and very timely study of how Presbyterians shaped and were in turn shaped by American culture over the past three centuries. As I read each chapter, I was reminded that the documentary heritage that provides the foundation for that history has been collected and preserved by PHS since its beginning in 1852. Fifteen years after the Old and New School split, PHS came into existence to collect and chronicle the history of the American Presbyterian church. PHS was there when the opening shots were fired on Fort Sumter in Charleston, South Carolina--the city of its birth--that resulted in a war that further divided both the church and our nation. It celebrated the reunion of Old and New School Presbyterians a few years after the end of the Civil War. It was there to document the intense debates over Darwinism, temperance, biblical inerrancy and a “separate but equal” society created by our judicial system. In the twentieth century, it witnessed our denomination’s increased role in ecumenism and the church’s struggles with issues of war and peace. PHS was there during the Fundamentalist and Modernist debates in the 1920s and 30s. It documented the intense debates about the appropriate role of women and other groups in the life of the church, the intense debates over the meaning of life and what it meant to be a prophetic witness in the world. 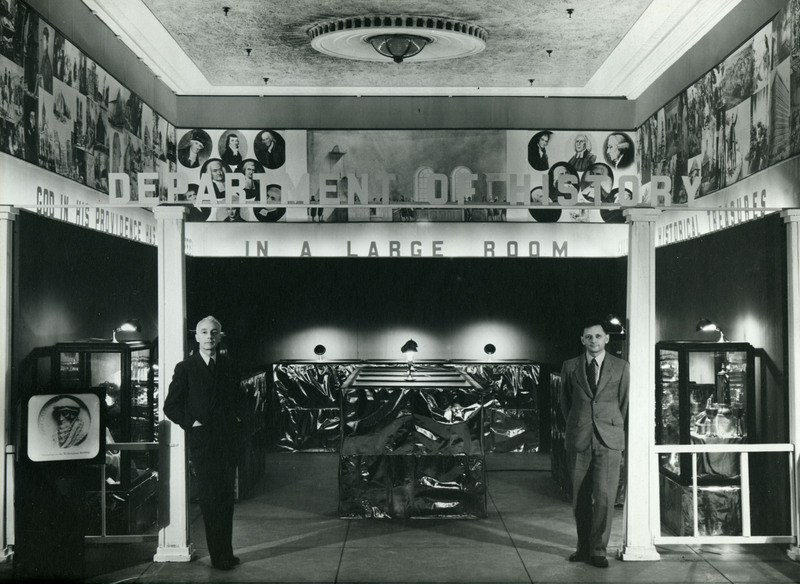 Thomas C. Pears (on left), Director of the Presbyterian Historical Society, and staff member Guy Klett ready for the unveiling of the PHS exhibit at the 1938 PCUSA General Assembly meeting at Convention Hall in Philadelphia, celebrating the sesquicentennial of the first General Assembly. 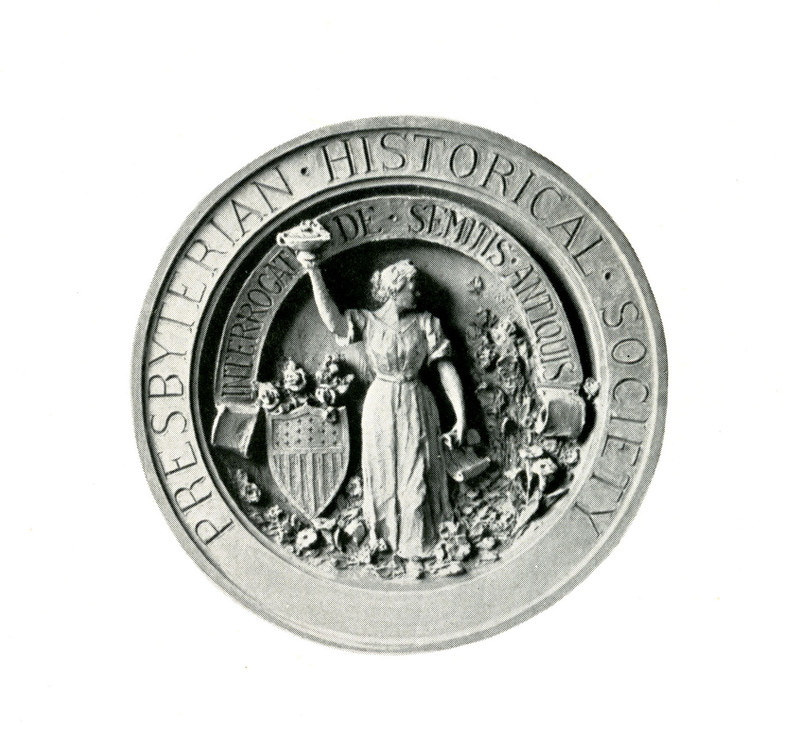 And now more than a decade into this century, the Presbyterian Historical Society continues to collect, preserve, and share the story of the American Presbyterian experience by connecting with Presbyterians in new and exciting ways. How we fulfill our original mission will be shaped by the technological advances that have redefined both the informational and archival landscape. So as the Presbyterian Church (U.S.A.) seeks to become a more missional church within a newly emergent global movement, PHS will continue to fulfill its core mission. As the PC(USA) lives out its mission within the context of nFOG and the myriad of issues which both divide and unit us as a people of faith, PHS will continue to guard our heritage against both the fires “that consume and the folly that forgets, providing a sacred, silent witness to the struggles and sacrifices” of those who have gone before for the benefit of the next generation of Presbyterians.